Purchase the yarn for your next shawl beginning March 4 and be eligible to enter a friendly competition. 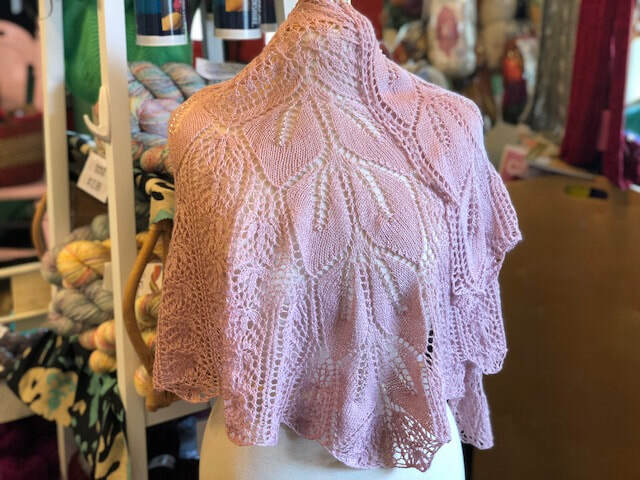 Your finished shawl can be shared at the store & visitors can vote for their favorite. Prizes valued over $300 will be awarded the top vote-getters at the conclusion of the Crawl. Please see the April newsletter for details on prizes to be awarded. 1. Shawls can be either knit or crochet or woven and can be any shape or size. 2. Yarn must be purchased from Echo Valley Fiber. 3. To enter, complete the Registration Form available at the time of purchase -- and you'll get 10% off the yarn for the project you're entering. No combined or additional discounts. One entry per person. 4. Completed shawls will be accepted through May 24. Each entry will be matched to its original application and photos will be taken. EVF accepts no responsibility for shawls entered but will endeavor to keep all entries safe and fairly displayed. 5. First shawl returned will receive the #1, second #2, and so forth. All shawls will be displayed at the store without names of crafter, identified by number only. 6. Voting begins May 27 and ends June 3. 7. No purchase required to vote. 8. Only one vote can be cast per person per visit to the store. 9. Winners will be announced and prizes awarded Saturday, June 8 at 12 noon. Need not be present to win, prizes can be picked up at the store later if winners are unable to attend. Winners, if not present, will be notified by email. Top 4 shawls receiving the most votes will be able to select their yarn prizes. 10. Shawls can be picked up on or after June 8. No shawls can be returned by mail.